The little owl (Athene noctua) belongs to the family of owls and owlets, the Strigidae. The little owl species is distributed in the west and central Europe, Mediterranean region, north Africa, west and central Asia, northern India, China, Mongolia, southern and eastern Russia. These owl species have been been introduced to New Zealand and the United Kingdom. These owls are polytypic species. 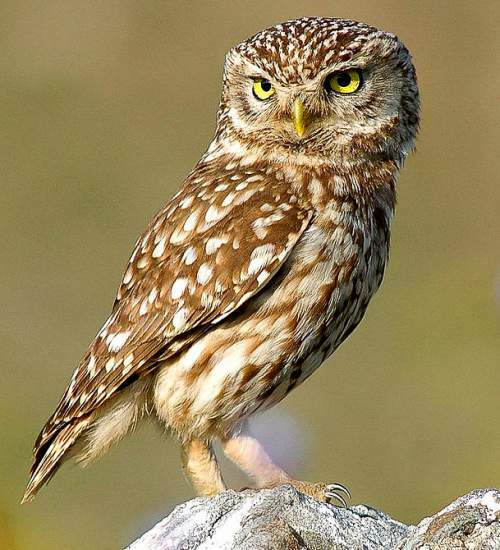 The little owl (Athene noctua) is a small owl, measuring 20 to 25 cm in length and weighing 160 to 200 grams. The wingspan is 55 to 60 cm. The little owl has flat crown, plump body and short tail. The upperparts are grayish brown and are spotted and streaked white. The underparts are pale and are streaked brown or grayish brown. The head is large and the facial disc is prominent. The white feathers surrounding the eyes impart a frowning expression. The bill is pale yellow. The irises are bright yellow. The legs are long. The call of these owl species is a whining "kiew..kiew" sound. The little owl species are distributed in the west and central Europe, Mediterranean region, north Africa, west and central Asia, northern India, China, Mongolia, southern and eastern Russia. In India, these little owls are distributed in the states of Jammu and Kashmir, Himachal Pradesh, Uttarakhand, West Bengal, Sikkim and Arunachal Pradesh. These owl species have been introduced to New Zealand and the United Kingdom. Well established feral populations are found in these two countries. The Important Bird and Biodiversity Areas (IBA) of the little owl species in Bulgaria are, Kamchiyska Mountain, Western Strandzha, Ludogorie and Western Balkan. The IBA in France are, Crau and Plateau de Valensole. The IBA in Italy is Mount Cervati. The IBA of the little owl in Greece are, Thessaly plain, Southern Mani, Mount Sanghias, Cape Tenaro, Mounts Dias, Mavrovouni and Koronos, Central Rodos, Mesanagros, Katavia-Prassonisi, Antikhassia mountains and Meteora. The IBA in Spain is Mountains of Barcelona. These little owl species do not normally occur in forests. They normally occur in altitudes from 0 to 2600 meters. The artificial ecosystems and habitats of these owl species include cultivated lands, pasturelands, rural gardens, plantations, orchards and urban areas. 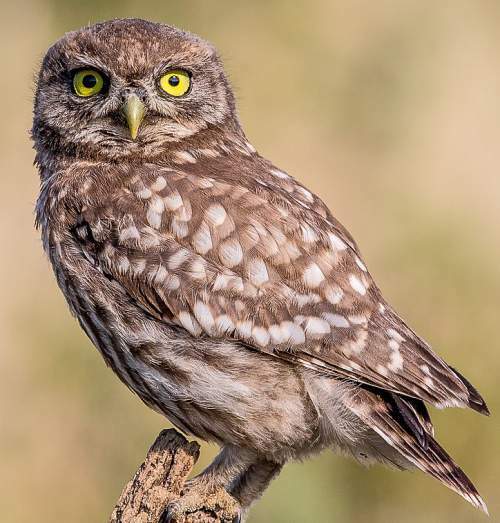 The natural ecosystems and habitats of these little owl species include, boreal shrublands, dry savanna, temperate grasslands, tropical and subtropical shrublands, open countryside and semi-deserts. The diet of this little owl consists mainly of small vertebrates. Small mammals, birds, reptiles, amphibians, large insects and earthworms are their primary food. These owls mostly perch on elevated positions and swoop down on the prey. They hide surplus food in tree holes. The breeding season of these little owl species is from March to August in most of their ranges. The nesting sites are usually cavities in trees and also holes in walls and buildings. The cavity is cleaned before laying eggs. They readily accept nest boxes for laying eggs. These little owl species are monogamous and highly territorial. The clutch usually contains three to six white eggs. The female incubates the eggs and later broods the chicks. The male hunts and feeds the female and chicks. These little owl species are non-migrant, resident birds. They disperse locally after breeding. The populations in higher altitudes descend to the lower levels in winter. Post breeding, the juvenile owls may disperse and establish in new locations within the range. Within their range they may make local movements for feeding and breeding. The global population size of the little owl (Athene noctua) is estimated to number about 1,240,000 to 2,340,000 mature individual birds. The overall population trend of the species is considered to be stable. In most of its range, this owl species is reported to be common and locally very common. The generation length is 4.4 years. Its distribution size is about 52,900,000 sq.km. Habitat alteration and destruction, severe winter, felling of old trees resulting in loss of nesting holes, hunting and capture for pet-trade are the main threats that are endangering the survival of these owl species. The little owl (Athene noctua) does not approach the thresholds for being Vulnerable either under the range size criterion, or under the population trend criterion or under the population size criterion. 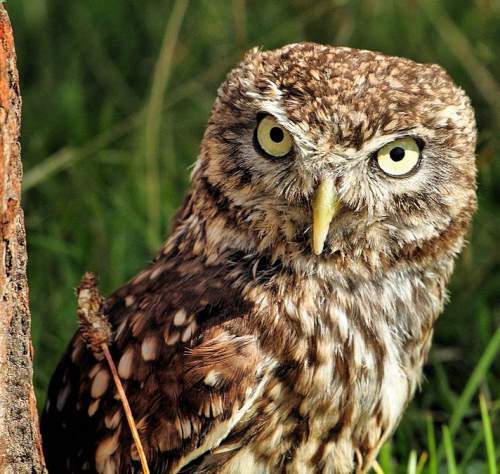 The CITES (Convention on International Trade in Endangered Species of Wild Fauna and Flora) status is ‘Evaluated’ for little owl (Athene noctua) and listed in Appendix II. The little owl (Athene noctua) is closely related to the spotted owlet (Athene brama). The thirteen recognized subspecies of the little owl are: A. n. noctua, A. n. vidalii, A. n. plumipes, A. n. ludlowi, A. n. indigena, A. n. glaux, A. n. impasta, A. n. orientalis, A. n. saharae, A. n. spilogastra, A. n. bactriana, A. n. lilith and A. n. somaliensis. Recently updated and current topic in Bird World: Little owl - Athene noctua.